Postnatal yoga has become popular with new moms in recent times as it comes with many health benefits. Like prenatal yoga, postnatal yoga provides numerous physical and emotional benefits including strengthening areas such as your back, pelvic floor muscles and abdominal muscles, relaxing specific parts of your body and decreasing stress and recharging your mind, in addition to shaping and toning the body. It also helps increase endurance and stamina and it is said to reduce fatigue and help with weight loss. New moms may be eager to return to their yoga classes, but it is important to do so in a safe manner. With the guidance of a qualified yoga instructor, postnatal yoga can be a great way for new mothers to practice yoga in a safe way and have some “me” time. Postnatal yoga can help rebuild flexibility and develop strength in important areas such as upper body, back muscles and abdominal muscles. Yoga helps to loosen joints everywhere in the body, including the pelvis, spine, and shoulders and tone and stretch your upper body. 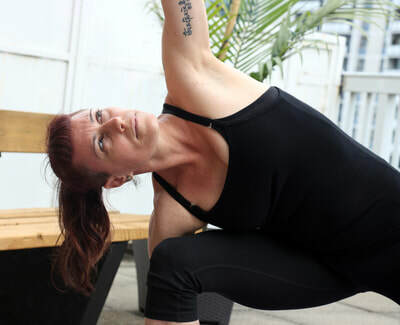 Melanie Schorr teaches a variety of yoga types including postnatal yoga. When she taught yoga at her yoga studio in Koh Phangan, Thailand, she began teaching pre-and post-natal classes. privately. If want to learn more about postnatal yoga, book your private lesson with Melanie and experience the benefits first hand.